1. Have a dedicated workspace. Similar to your organization’s office setup, it’s important to have an area that is reserved for you to conduct work-related activities at home. We’re not talking about placing a thick cushion on your kitchen barstool, but a separate workstation to which you relocate when it’s time to work. Ensure that your home office layout is adjusted properly so that the soft tissues and joints in your body will thank you shortly after you start working. Follow the Seated Workstation Adjustment Flowchart to help you achieve the most comfortable setup for you. 2. Leave your food in the kitchen. Just as you should have a dedicated workspace, you should also consider an alternate location to eat. The idea of multi-tasking over lunch is appealing, but it’s easy to forget about preserving space for typing, mousing, and referencing documents. 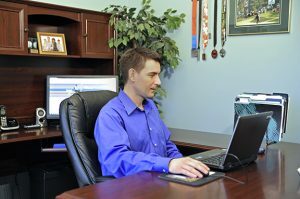 Give yourself enough whole-body clearance around the computer, keyboard, and mouse so that you don’t add to congestion and create an opportunity for awkward postures or discomfort to develop. 3. Bring the light. Research suggests that lighting significantly affects human performance. Your home office shouldn’t be tucked away in a dark corner; locate it in a well-lit area that’s as close to ambient lighting as possible. Mental fatigue, Seasonal Affective Disorder (SAD), and attitude will improve if this is done correctly. Your work area should have between 200 and 500 Lux (1 Lux = 1 Lumen/m^2). I hope this helps, and cheers to staying productive!